In large skillet over medium heat, cook pancetta until crispy. 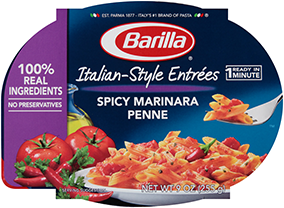 Cook pasta according to package directions; drain, reserving 1/2 cup pasta water. Add olives, chilies, pasta water and pasta to pancetta. Heat through. Toss in cheese and season with crushed red pepper and salt.